Does the term "Color Space" make you blue? This is a republishing of a video I published on another YouTube channel. I take you through some color theory that anyone can understand, and then show how you can use that knowledge to take your photos through a color-managed workflow the best way possible. The original PetaPixel article can be found here. Well, apparently not as this pic was from a few days ago. Rainy season in South Florida. It's a downpour one minute, then hot, steamy, and sunny the next. So far behind in my posting. But, that just means I'm busy doing other things. Happy October! 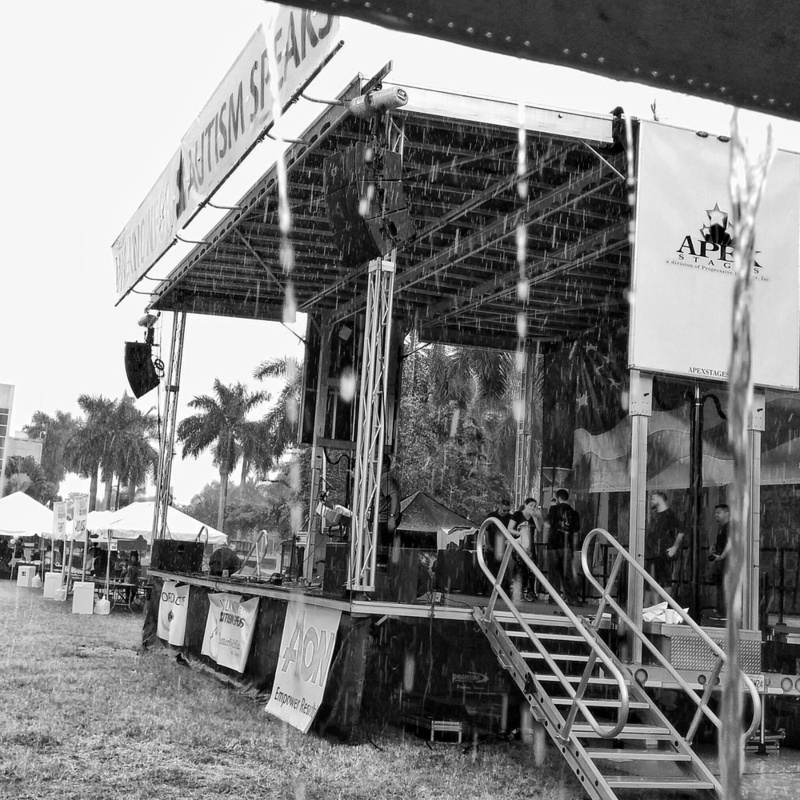 Taking shelter during a deluge this past Saturday at an Autism Speaks charity walk. It's been a toasty summer so far and we're just at the start of August. I'm thinking of winter adventures to help beat the heat. "Nothing ever happens when you’re ready. You’ll always be in over your head. Embrace it. Learn to love the fear." So what does that chart really mean? So just what is that MTF chart that we see in lens reviews? I was just catching up on a little reading over on PetaPixel and I came across an interesting article about how to read the MTF chart that you see in lens reviews. I thought it was worth sharing. As mentioned in the article, it's one piece of info to help you determine how the lens would perform. But, it's not the only thing to take into consideration. Click here to read the article or "Click the pic." Every now and then it's nice to change things up a little. I'll be spending part of the day to do some pet portraits for some friends. Taking portraits of our four legged friends who don't understand "Sit" and "Stay" can make for an interesting day. I guess it is the same for those of you that do baby portraits. I use squeaky toys, snap my fingers, and in the case of Henry the Bunny, I wave a little cilantro around. While it can be a bit of work, it's also a lot of fun. What do you do to "Change it Up?" Well, here we are about a month and a half into the Lightroom upgrade to CC and to sum up the experience, I guess I vacillate between two words, "eh" and "arg." Overall, everything was working fine. I tried out the new features and LR seemed a little bit faster. But, that changed about a week ago. As is normally the case, I was working on a large project and LR essentially came to a stop. It wasn't hung, but it was at near glacial speeds. I was changing photographs, the full size image came up on my 2nd monitor with the little "Loading" message at the bottom of the photo. Instead of the animation spinning for a moment, it was just sitting there. No matter what I clicked on, nothing happened. Like most would do, I went to Task Manager to kill off the app. But, I noticed it didn't have a not responding message. I also noticed that LR was using about 50% of my processor (8 core i7). Normally, it is somewhat lower than that unless I'm exporting a large set of photos. I don't know why I noticed it, but after doing a little digging around I noticed that the little spinning icon next to the loading message had moved just a little bit. So, LR wasn't hung. It was just moving at a glacial pace. I decided to kill off the app after about 20 minutes. After I closed it, I checked to insure I had plenty of disk space and I had previously checked that I had no memory or pagefile issues. I restarted LR and, thinking it was just a fluke or bad joo joo, continued editing my project. Within about 10 minutes the same thing happened again. To cut to the chase, I optimized my catalog, deleted my preview cached, increased the cache size in Settings, and turned off the "Use GPU" option. I still have the same symptom. I've been scanning the forums to see if anyone else has run into this. So far, no luck. I'm contemplating removing LR and re-installing. But, before I get that drastic, I'm going to do a little more digging. I can still use my desktop[ for short duration work it seems. My laptop is not exhibiting the issue. I can always do things there and migrate catalogs later. What is your backup strategy? I continue to be amazed at how many photographers do not have a solid workflow or backup strategy in place. This article just reinforces why it is so important. I talk to many people who don't have a strategy or where to even start. Take a few moments to consider how you should protect you work. So, I turned on the computer a little while ago and I saw an update notice from Creative Cloud. It would appear the new version of Lightroom is here. I've just finished installing it on my Windows 8.1 desktop as well as my MacBook Air and I have to say that I'm pretty happy. It installed quickly and seems to be rather snappy. Performance was one of the areas they were supposed to be focusing on for this release and I can see it. I'll be playing more with the new release over the next week or so. I did find one small issue though on my Windows machine. Whenever I went into the Develop module, Lightroom would lock up and Windows would report it as Not Responding. Having a similar issue in previous releases, I deleted my Lightroom Catalog Previews.lrdata file. Once I did that, everything ran fine. There's always going to be one thing that gets you when updating software. Hopefully this is it. Too much time at your desk editing photo's? While not a technical post, it is something that we all run into at one point or another. Sitting or standing at our desks for long periods of time trying to finish up a project. I just finished an editing job that required quite a few hours in my desk chair and my body wasn't afraid to make me aware of that. Canon just shared an article from TheMuse.com with a great infographic on stretches that you can do at your desk. It's a good reminder that every now and then you need to take a break and stretch the body out. Hello everyone.... A sad loss in the family has been keeping me busy as well as drained the batteries some. But, I'm back, with camera and computer in tow, and getting back into the swing of things. To kick off 2015, I start with a recent post about Lightroom 6. If true, we'll get a performance boost as well as some new features. To learn more, check out this PetaPixel article. If you're looking for resources and tools to help take your photography to the next level, I highly recommend you take a look at "The Complete Photography Bundle II" that is on sale for the next five days. It's a great collection of training videos, e-books, LR/PS presets and actions, and much more from photographers like Trey Ratcliff, David DuChemin, Zack Arias, Serge Ramelli and many more. For more details, click the pic. And, for complete transparency, I'm not affiliated with the offer in any way. I just enjoy many of the contributors work and want to share. This is pretty interesting. I was wondering if there would ever be a streaming or "on demand" option. Yes, I do understand this requires a constant Internet connection. But, it's another tool that may meet the need for some. Click the pic for more details. For those of you that use the ColorMunki Photo and Design apps, it looks like the folks at X-Rite are looking into some issues with the upcoming Mac OS X release Yosemite (10.10). New installs will fail and existing installs will crash. Click the pic to go to their notice. I'm a huge fan of continuing education. I'm always reading, researching, and experimenting. One of the ways I try and sharpen my creative skills is to take a photo workshop when time allows. It's a great way to meet fellow photographers, learn new things, and provides a window of time where you just focus on being creative. One of the workshop series I enjoy is the Popular Photographer Mentor Series program. It's a great way to visit new locations and spend time with established photographers who have worked or are still working for entities such as Time Magazine, National Geographic, Sports Illustrated, and so on. I always learn something new at these events and have been participating in the program for the last 9 or 10 years. I was pleasantly surprised about a month or so ago when I was selected to have a member profile appear in Popular Photography Magazine. It's a short piece. But, I'm thrilled to have been selected. (Click the pic below to be taken to the online article). After being told about this. I started looking at my photographs over the years and saw how my style and story telling skills have changed. As Creatives, our world is always changing and requires an investment of time to keep up everything. Cameras and software change. New features like WiFi (in camera, wireless tethering to computers, tablets, and phones) and wireless (remote triggers, lighting, etc) can cause a lot of head scratching when they don't work quite right. Backup strategies and optimizing your desktop or laptop for the best performance requires an investment of time. With all of these things taking up slices of our time, we want to make sure that we make time to experiment with our creativity. To learn more about the Mentor Series program, please visit www.mentorseries.com. I was reading an article on MainStreetHost.com by Kathryn Wheeler. The article provided a great cheat sheet that shows you the dimensions for the header/cover photo, profile photo, etc. It's a handy reference as we continue to use social media to promote our brand. Anything that can save a little bit of time is useful. Click the infographic to get to the original article. Enjoy. I came across this shortcut mapper for Lightroom and Photoshop while catching up on my reading a few weeks back and have found it rather handy. Unfortunately, I can't recall where I read about it and can't give them credit for publicizing this great utility. It may have been a PetaPixel article. What I can tell you is that this is a GitHub project and more information about the app and creator can be found there (link at the bottom of the post). You can select the app as well as the module in the case of Lightroom. If you hold down the Control, Alt, Shift (Windows) or Control, Option, Shift (Mac) keys the keyboard will change to reflect the new shortcut keys. If found it rather handy and my mental shortcut list has grown quite a bit since using it. I hope you find it helpful. To use the the web app, click here. To go to the GitHub site for more details on the app and creator, click here. Guinness US released a commercial titled "Empty Chair" over the July 4th weekend that reminded me of how powerful not saying anything can be. With the exception of a few moments of narration at the very end, the message is delivered by the visuals and a little music in the background. This video is simple, yet conveys a strong message. As Creatives, we use our various mediums to convey emotion and tell a story. When I see a great example, I like to call it out. After a discussion with a few photographers this weekend, I thought I would re-share this tech tip in case others were not aware of the work around. When you import photo's into Lightroom (5.4 and below) from a card reader, the process is painfully slow. It seems to take nearly twice as long than if you copy the files from the card directly to your desktop. As a work around, you should do just that. Either copy the files to your desktop or the location of your library. Then, in Lightroom, import them and use either the Move or Add command. You will find this process a lot faster than if you were to import them from the card within Lightroom. I talked to a few people from Adobe at the last Photoshop World and they were familiar with the issue. But, they did not know why it happened or if it was going to be addressed. In the mean time, use this workaround to save a little time.